In some discussion on RCGroups.com, I learned that the new Surpass camshaft (OS #45202010) could be installed in the original FS-40. The new cam has more duration and lift which results in more power, and of course, fuel consumption. I was more interested in putting the old cam in the newer engines to see how it effected economy of the diesel conversions. I quickly found that while the new cam is a drop in upgrade in the old engine, it doesn't work the other way around. The old cam has a very wide skew gear that doesn't fit between the lifters of the new engines. 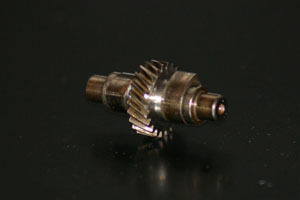 Measurements showed the witdh of the gear was the only thing in the way of this swap. 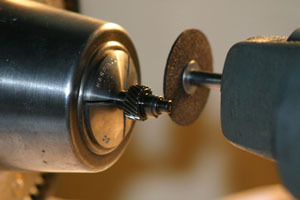 The easy fix was to grind away the offending part of the gear for clerance. 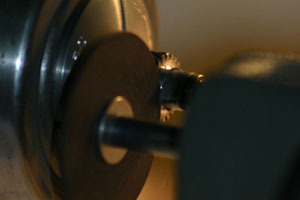 Here is the setup on the lathe. The feeds were very low so as not to build up heat or put excessive load on the part as the work holding setup was not ideal. The process was uneventful as hoped.